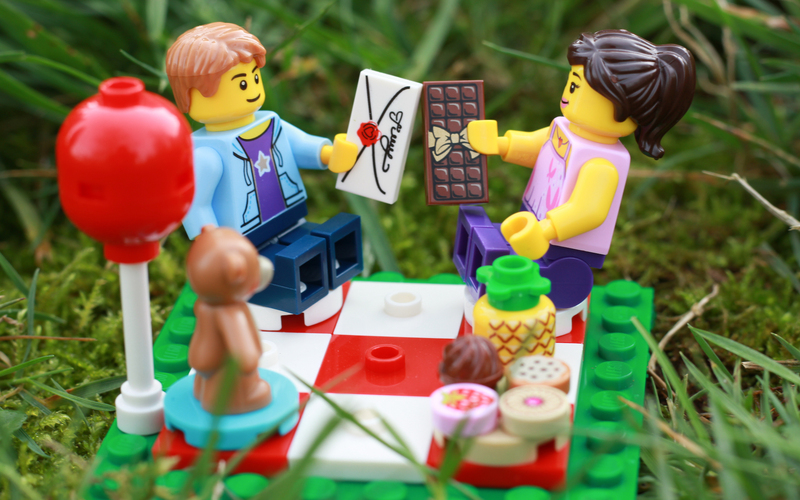 Love is in the air, so it’s the perfect time to review the first seasonal LEGO kit of the year: 40236 Romantic Valentine Picnic! Like last year’s seasonal sets, 40236 comes with a couple minifigures, a few small builds, and a bevy of great accessories! Was Cupid’s arrow successful in making me fall in love with this set? Let’s find out! As one would expect with such a set, there are two minifigures included. 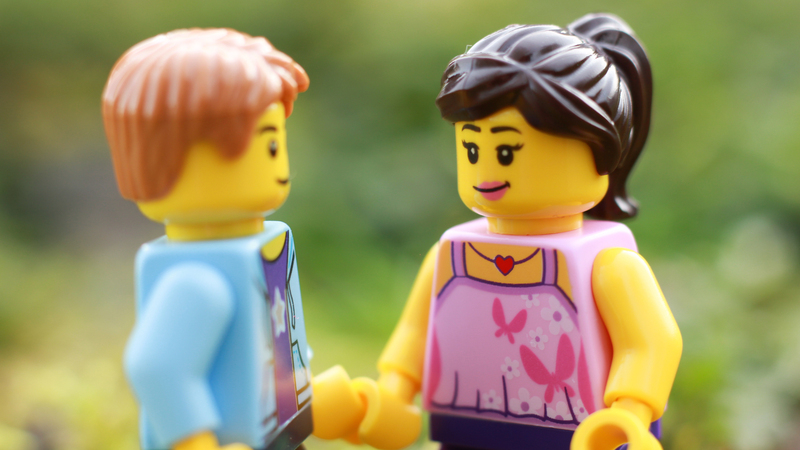 Upon first glance, the couple is rather simple, but with a bit of research I discovered that their torsos are relatively rare. His was last seen in 2016’s 60135 Fun in the Park while hers has been in just two others. The boyfriend’s head is very generic, while hers has a lovely expression and pink lips. Her head is reversible; the other side sports a wide smile and a pair of pink sunglasses. Because of their simplicity, I didn’t get very many photos out of this couple beyond my obligatory establishing shots. 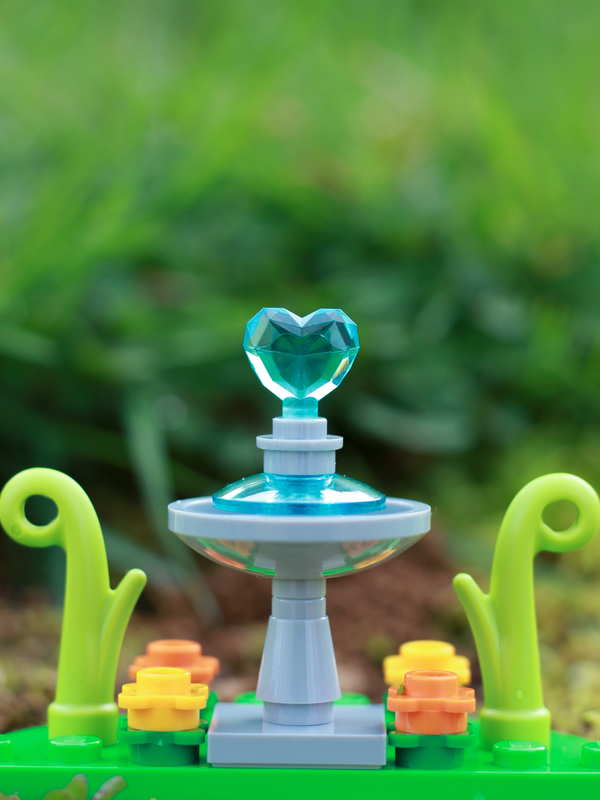 It should come as no surprise that the small vignette this time is a lovely picnic setting, which is cleverly placed upon three green tiles that form the shape of a heart. 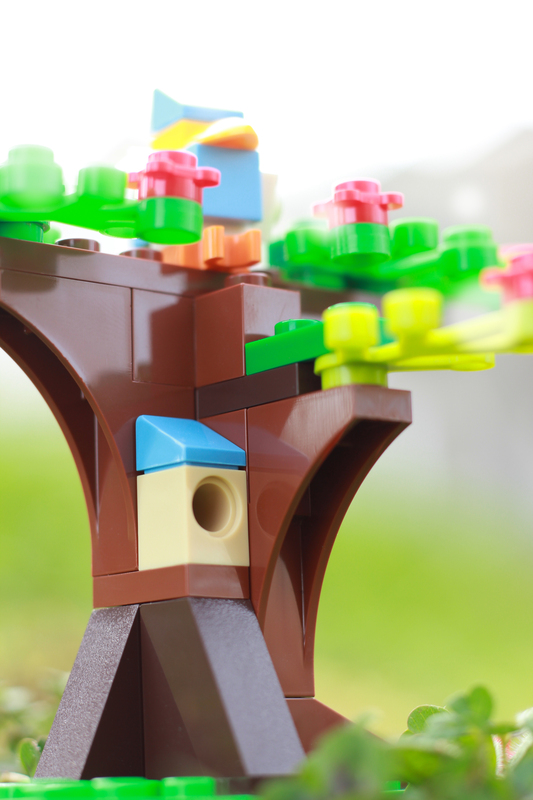 I love the little birdhouse! 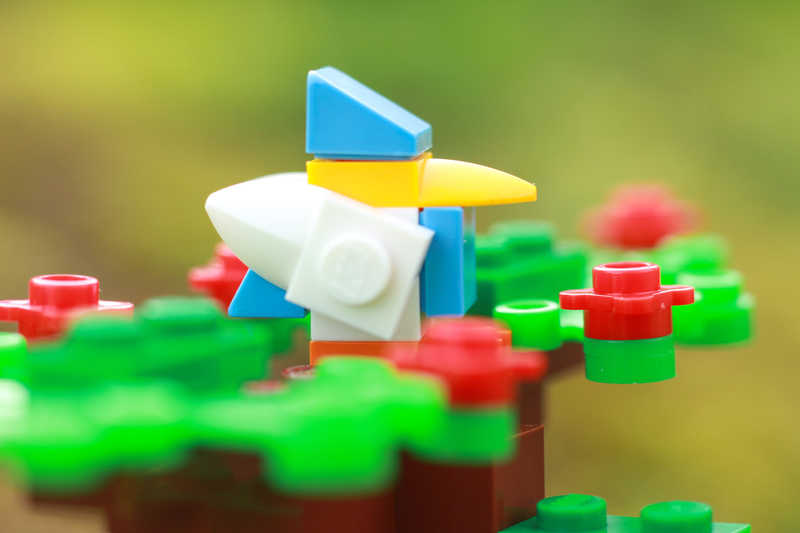 This bluebird is nice, but perhaps something resembling a lovebird might have been more appropriate? 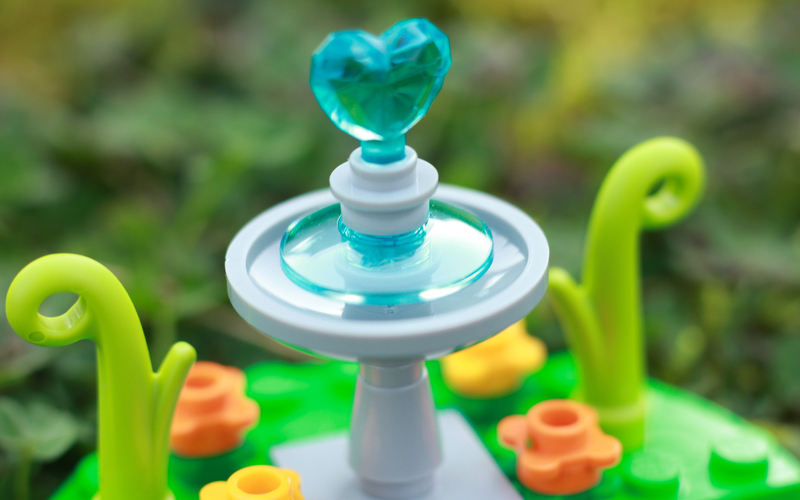 …While a wonderful petite fountain (with a crystal blue heart on top!) is on the other. The fountain is my favorite of the two, and the one I suspect I’ll get the most out of in future photos. It could easily make a nice birdbath, or act as a pretty scene-setter in the background. It’s adorned with orange and yellow flowers reminiscent of Spring, and two interesting, curly green plants. 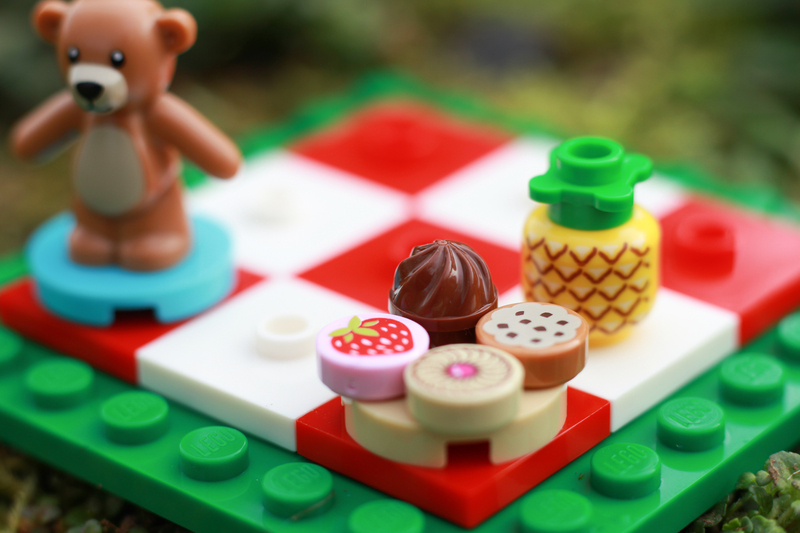 The main attraction is, of course, the red and white picnic blanket on the third green plate. It’s comprised of red and white square tiles, some of which have pegs on them for minifigure or accessory placement. When I photograph the blanket again, I’ll likely ditch the big green 8×8 plate for a 6×6. I found the tile itself hard to shoot around; it sticks out like a sort thumb when placed on actual grass. Of course, this could easily be solved by placing it alongside other green plates and using those to represent grass instead. 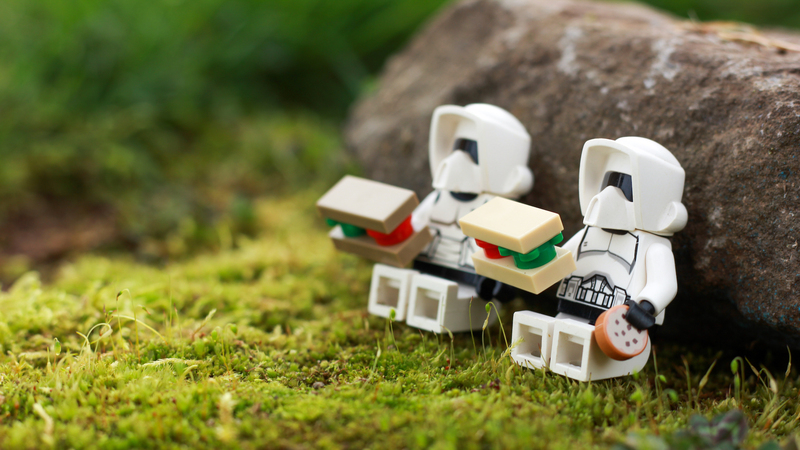 No picnic would be complete without snacks, and there are a plethora in this kit! In one of the photos above, you’ll see a red balloon and printed tiles showing a letter and a bar of chocolate. In addition, we have a small plate of pastries sitting atop the picnic blanket. My kit came with a few extra cookies, which I was extremely happy to add to my collection. There’s also a pineapple (a piece I didn’t own before and can’t wait to photograph again) and you’ll spot a quintessential toy photographer favorite: the teddy bear (which you can never have too many of!). 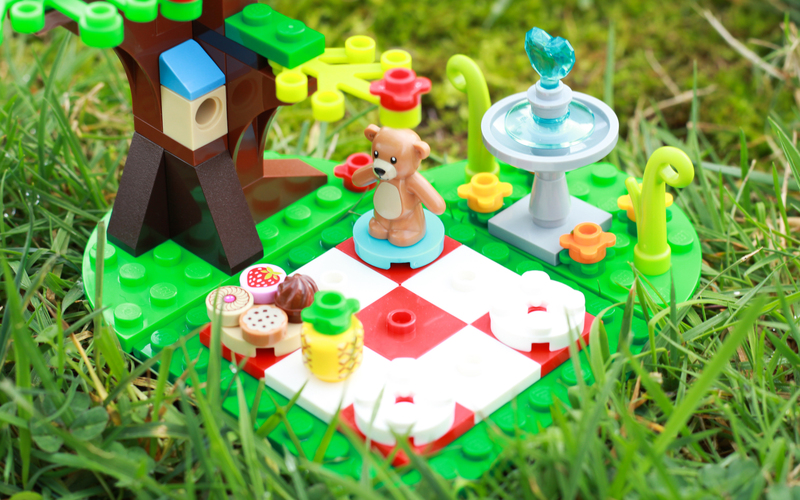 If your stomach is now rumbling, don’t worry, because the picnic isn’t comprised solely of sweets. There are two sandwiches as well, on two kinds of breads: White and wheat! How cool is that? It would never have occurred to me to do that. They come on a photogenic small brown table. 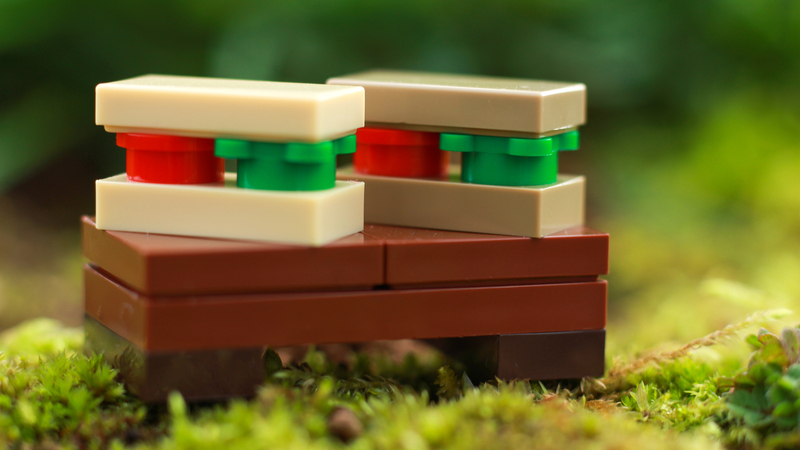 I immediately put the sandwiches to use, and know they’ll become a staple in my photography. This couple really went all-out when it came to this picnic, because we’re not through all of the accessories yet! Another standout is this tray of champagne. I was amazed at how convincing the typical green LEGO wine bottle looks as a champagne bottle with just a simple white circular tile on top. Again, it’s a small thing I wouldn’t have thought to do myself. And last but certainly not least, we have a wonderful bouquet of six dark pink flowers. 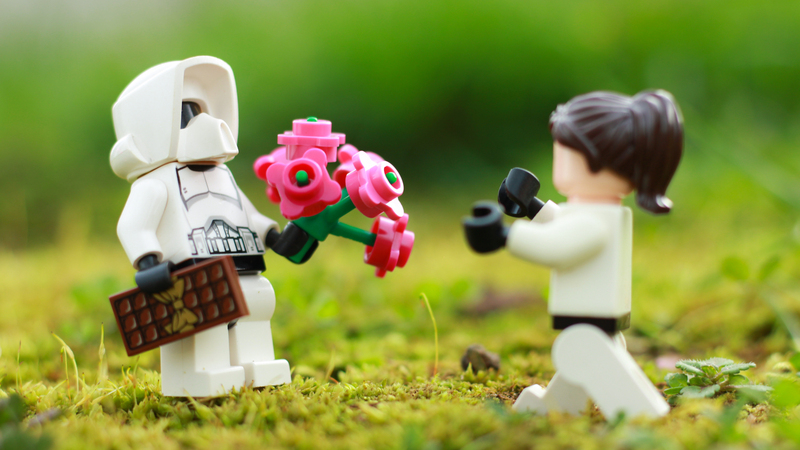 It’s nestled into a small red flower box, though I prefered taking the bouquet out and handing it to my minifigs. I absolutely loved this set. I was wooed by the variety of accessories, and while I’ll likely never photograph all of these pieces together again, various pieces of the small builds will come in handy later. The minifigures themselves didn’t inspire many setups, but they’re probably worth picking up if you’re missing the torsos or just want more smiling heads. 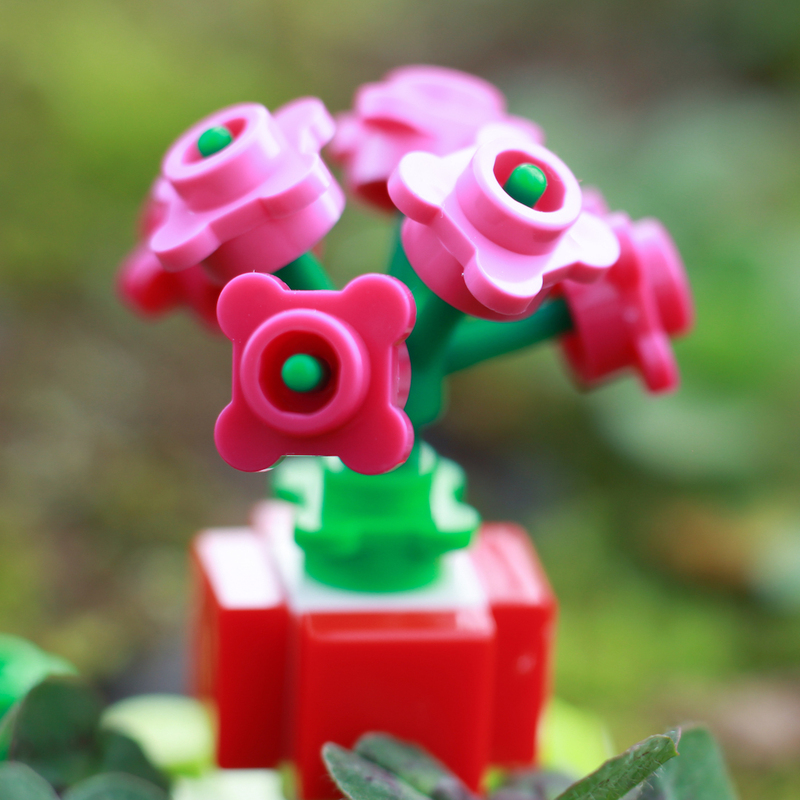 If you’re looking for a last-minute purchase to get you into the Valentine’s Day spirit, or simply need more LEGO cookies and flowers in your toy box, I highly encourage you to pick up this kit. Have you picked up this set yet? If so, how did your photographing experience go? I’d love to hear your stories in the comments below! If you’ve made it this far, come continue the discussion over at our G+ community! And while you’re at it, subscribe to our weekly email round up so that you never miss a post, and don’t forget to subscribe to the new Toy Photographers Podcast! Thanks, Lynn! 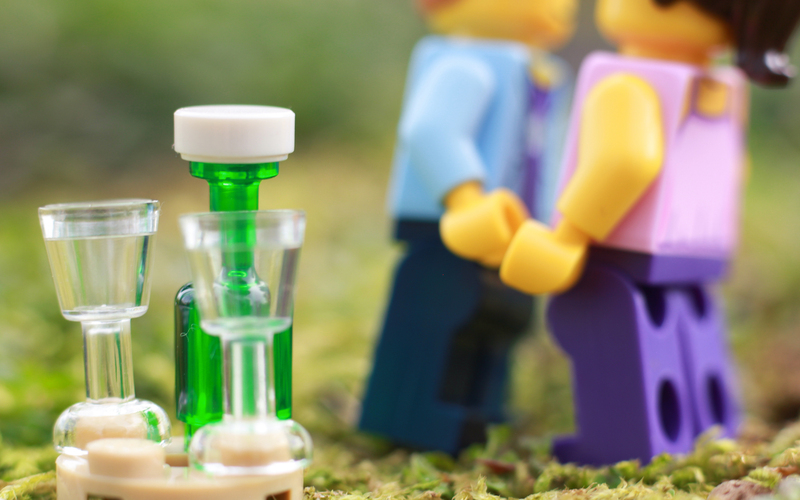 I actually thought of you when reviewing it, these minifgs look like they’d make great subjects for your Cute Couple series! Your pictures are always si beautiful! Thanks Karine! I actually just picked up one of those posable skeletons you use and am having a lot of fun with it. I was bummed that they aren’t able to hold LEGO accessories, but did find some luck in putting some sticky tac in the hands and then sticking the accessories to it. Not a perfect solution, and not all accessories will look accurate, but it’s worth a shot if you haven’t tried that already!